We recommend to use the FBX file format because it provides good flexibility and usually causes less trouble. We use some free 3D models from the website sketchfab.com for this tutorial. 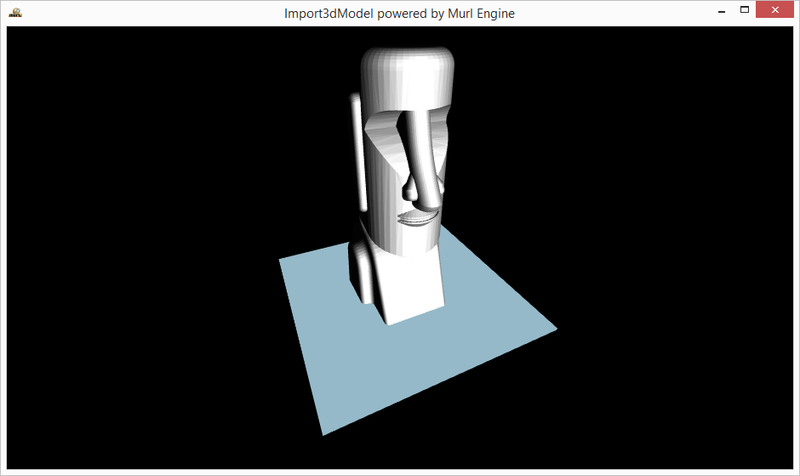 The first model is named Easter Island Head, has been created by Microsoft and is licensed under the Creative Commons Attribution license. We store the file easter-island-head.stl in the folder data/orig/easter-island-head. The Scene Converter tool with the parameter -z can be used to analyze the file. 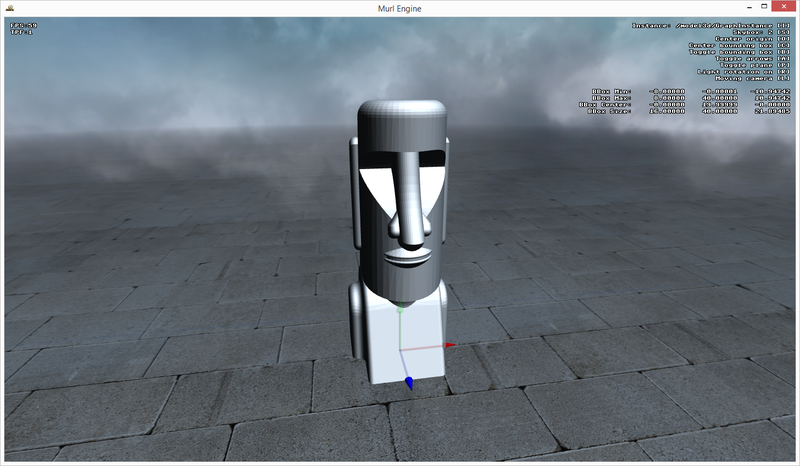 Scene Converter: Loading scene file 'easter-island-head\easter-island-head.stl'. Scene Converter:     Animation 0000: uc=0 name="Anim0"
Scene Converter:       Child 0000: index=0001 name="x3cSTL_BINARYx3e"
Scene Converter:       Mesh 0000: index=0000 name="Mesh0"
Scene Converter:           Mesh 0000: index=0000 name="Mesh0"
We can see that the model does not use textures, uses only one material and consists of 26980 vertices and 11176 faces. Next, we will convert the model and create a resource package. The Scene Converter tool (similar as the Atlas Generator tool) uses a XML configuration file as input. 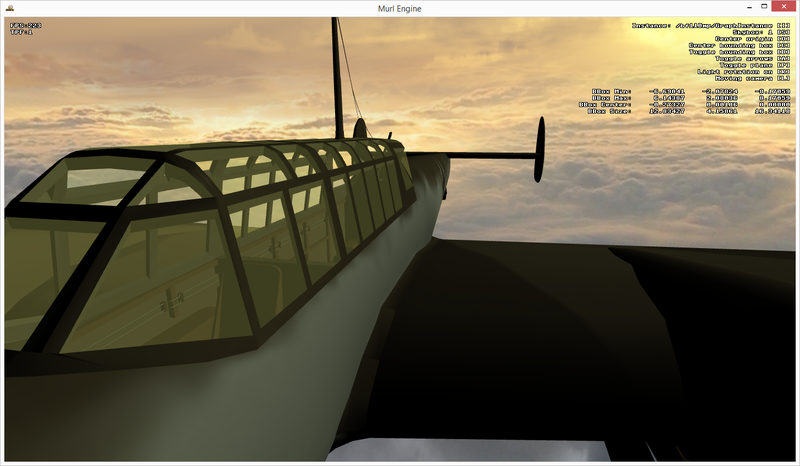 The navigation in the Scene Viewer is possible with the cursor keys in combination with the Shift key and the Alt key. The keyboard can also be used to toggle various elements. For example the key B can be used to display the bounding box of the model and the key S can be used to switch between different skyboxes. The assignment of the keys and the values of the bounding box are displayed on the upper right. The attributes are set with the parameter -a. We use rotateX to rotate the 3D model and translateZ to move the 3D model into the center of the X/Z plane. 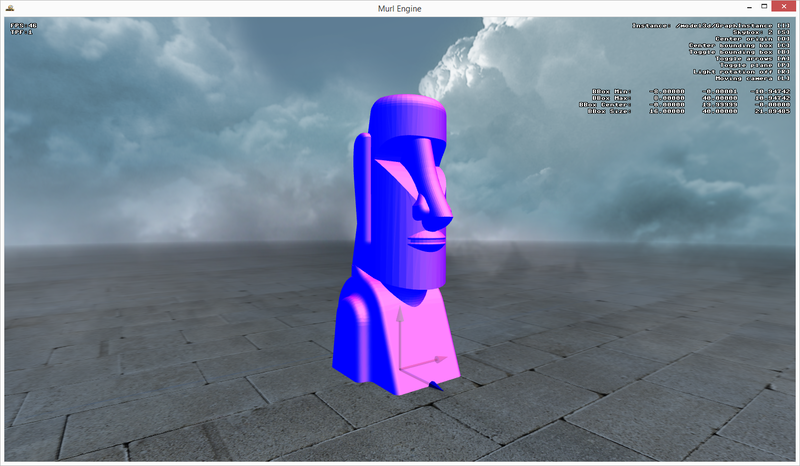 scene_converter -lv -c scene_config.xml -a "inputName=easter-island-head/easter-island-head.stl" -a "translateZ=-1.71558" -a "rotateX=-90d"
Now the orientation of the converted model is correct. 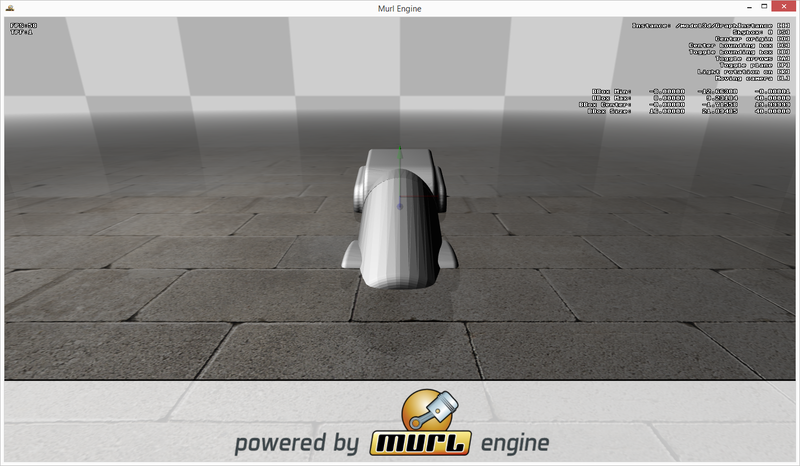 The created package is stored in the folder ../packages/model3d.murlres, as specified in the XML configuration file. We can load this package in our app code just like every other resource package. 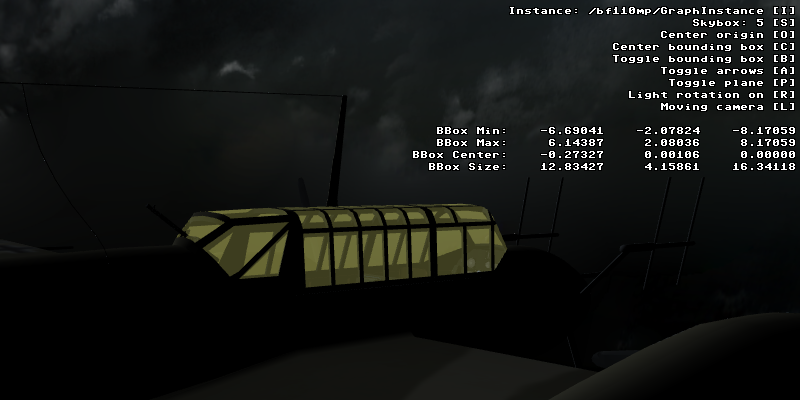 As a result the 3D model is displayed within our scene. We can replace this material with our own material. To do that, we change the configuration file and replace all materials with our material /myMaterial/mat_color_light_alpha and in addition specify diffuseColor and ambientColor. When we now convert the model with the Scene Converter, the model is rendered in the app using our material. Anyway, nothing is displayed in the Scene Viewer. 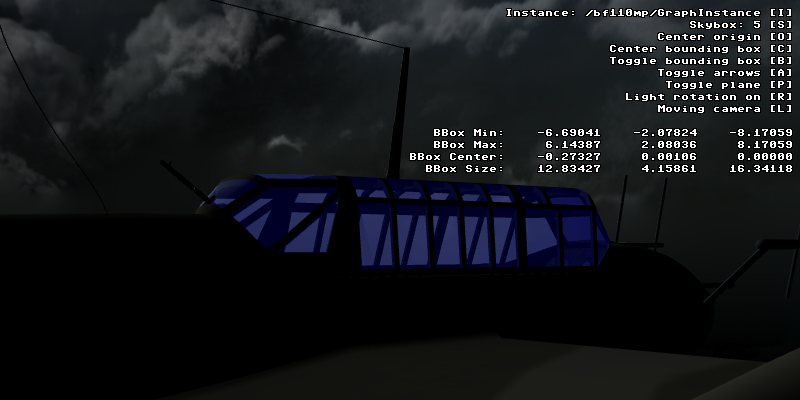 This is the case because the Scene Viewer does not know the material /myMaterial/mat_color_light_alpha. We need to additionally use the InputPackage parameter to specify the package that contains the material. Hint! It is advisable to define the materials in a separate package to be able to use it in the Scene Viewer as well as in the application. 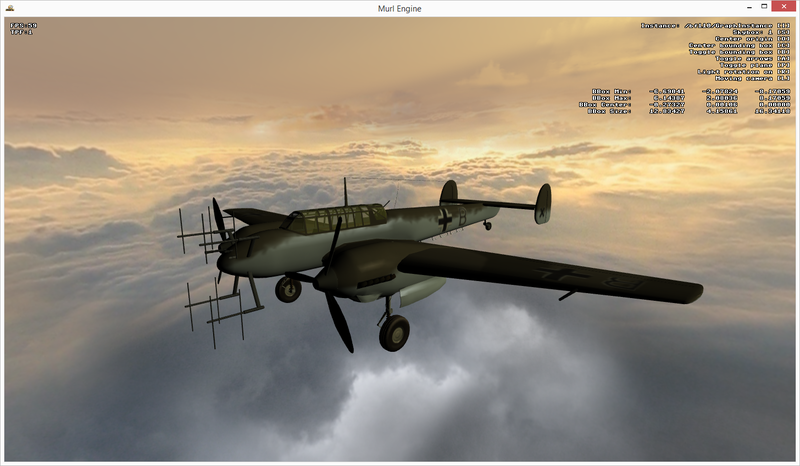 This model is named Messerschmitt Bf 110, has been created by helijah and is licensed under the Creative Commons Attribution license. The ZIP archive contains the 3D model in the OBJ file format and several textures in the PNG format. Scene Converter: Processing XML file "scene_config_bf110.xml"
Scene Converter: Importing scene from file 'bf110/bf110.obj'. Scene Converter: Loading scene file 'bf110/bf110.obj'. Scene Converter: Creating material texture for type 1 from file 'texture.png'. 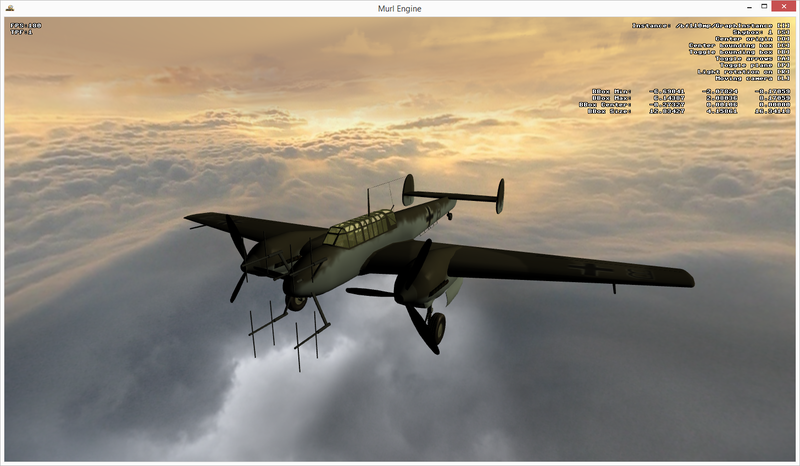 Scene Converter: Error Failed to parse materials from file 'bf110/bf110.obj'. Scene Converter: Error Failed to import file 'bf110/bf110.obj'. We can replace the material also for this model. But in this case we need more than one material, because the model uses textured geometry as well as non-textured, transparent geometry for the glass top. Scene Converter:       Texture 0000: index=0000 name="texture.png" semantic="DIFFUSE_RED/DIFFUSE_GREEN/DIFFUSE_BLUE/OPACITY_VALUE"
Scene Converter:       Texture 0000: index=0001 name="ai.png" semantic="DIFFUSE_RED/DIFFUSE_GREEN/DIFFUSE_BLUE/OPACITY_VALUE"
Scene Converter:       Texture 0000: index=0002 name="airspeed.png" semantic="DIFFUSE_RED/DIFFUSE_GREEN/DIFFUSE_BLUE/OPACITY_VALUE"
Scene Converter:       Texture 0000: index=0003 name="alt.png" semantic="DIFFUSE_RED/DIFFUSE_GREEN/DIFFUSE_BLUE/OPACITY_VALUE"
Scene Converter:       Texture 0000: index=0004 name="compass.png" semantic="DIFFUSE_RED/DIFFUSE_GREEN/DIFFUSE_BLUE/OPACITY_VALUE"
Scene Converter:       Texture 0000: index=0005 name="compass2.png" semantic="DIFFUSE_RED/DIFFUSE_GREEN/DIFFUSE_BLUE/OPACITY_VALUE"
Scene Converter:       Texture 0000: index=0006 name="fuel.png" semantic="DIFFUSE_RED/DIFFUSE_GREEN/DIFFUSE_BLUE/OPACITY_VALUE"
Scene Converter:       Texture 0000: index=0007 name="gear.png" semantic="DIFFUSE_RED/DIFFUSE_GREEN/DIFFUSE_BLUE/OPACITY_VALUE"
Scene Converter:       Texture 0000: index=0008 name="guns.png" semantic="DIFFUSE_RED/DIFFUSE_GREEN/DIFFUSE_BLUE/OPACITY_VALUE"
Scene Converter:       Texture 0000: index=0009 name="interior.png" semantic="DIFFUSE_RED/DIFFUSE_GREEN/DIFFUSE_BLUE/OPACITY_VALUE"
Scene Converter:       Texture 0000: index=0010 name="jauges.png" semantic="DIFFUSE_RED/DIFFUSE_GREEN/DIFFUSE_BLUE/OPACITY_VALUE"
Scene Converter:       Texture 0000: index=0011 name="man.png" semantic="DIFFUSE_RED/DIFFUSE_GREEN/DIFFUSE_BLUE/OPACITY_VALUE"
Scene Converter:       Texture 0000: index=0012 name="manette.png" semantic="DIFFUSE_RED/DIFFUSE_GREEN/DIFFUSE_BLUE/OPACITY_VALUE"
Scene Converter:       Texture 0000: index=0013 name="manettes.png" semantic="DIFFUSE_RED/DIFFUSE_GREEN/DIFFUSE_BLUE/OPACITY_VALUE"
Scene Converter:       Texture 0000: index=0014 name="panel.png" semantic="DIFFUSE_RED/DIFFUSE_GREEN/DIFFUSE_BLUE/OPACITY_VALUE"
Scene Converter:       Texture 0000: index=0015 name="pedals.png" semantic="DIFFUSE_RED/DIFFUSE_GREEN/DIFFUSE_BLUE/OPACITY_VALUE"
Scene Converter:       Texture 0000: index=0016 name="throttle.png" semantic="DIFFUSE_RED/DIFFUSE_GREEN/DIFFUSE_BLUE/OPACITY_VALUE"
Scene Converter:       Texture 0000: index=0017 name="turn.png" semantic="DIFFUSE_RED/DIFFUSE_GREEN/DIFFUSE_BLUE/OPACITY_VALUE"
Scene Converter:       Texture 0000: index=0018 name="vsi.png" semantic="DIFFUSE_RED/DIFFUSE_GREEN/DIFFUSE_BLUE/OPACITY_VALUE"
Obviously the model uses 21 different materials in total and only the materials transparent and transparentExt do not use textures. 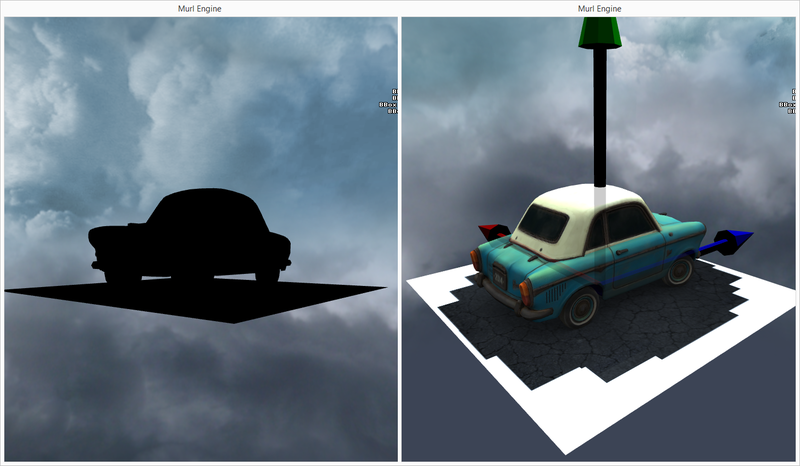 We replace these two materials with mat_color_alpha and all other materials with mat_color_light_texture. At first sight the result looks faultlessly. The textured faces as well as the transparent faces are rendered with the correct material. In this view two windows are rendered darker than the others. The cause for this issue is the draw order of the geometries and the activated depth buffer mode of the transparent material (depthBufferMode="READ_AND_WRITE"). If a transparent window has been drawn, afterwards no faces are drawn which are located behind the already drawn window. To render transparent faces correctly, they need to be drawn in the correct order (sorted from back to front). See also Order Independent Transparency. To improve the result, we can change the depth buffer mode of the transparent material to "READ_ONLY". Thus at first the opaque geometry is drawn with depthBufferMode="READ_AND_WRITE" and afterwards the transparent geometry is drawn with depthBufferMode="READ_ONLY" (see also Tutorial #14: Render Order). This is working well because all transparent faces are drawn with the same color (without consideration of light). If light should be considered, we can render the transparent geometry with a Graph::MultiMaterial. The transparent geometry is then drawn twice. In the first pass only faces which look away from the camera are drawn (visibleFaces="BACK_ONLY") and in the second pass only faces which look to the camera (visibleFaces="FRONT_ONLY") are drawn. For this we define two materials, specify the sortOrder and combine the two materials to one Graph::MultiMaterial. We use this Graph::MultiMaterial to render the transparent geometry. In addition we change the ambientColor to create a blueish appearance. 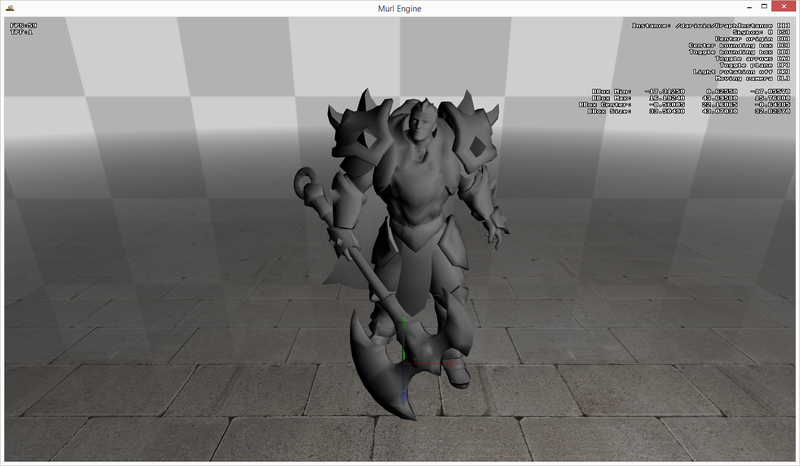 This model is named Darius, has been created by kraken and is licensed under the Creative Commons Attribution license. The ZIP archive contains the 3D model in the OBJ file format and one texture in the TGA format. 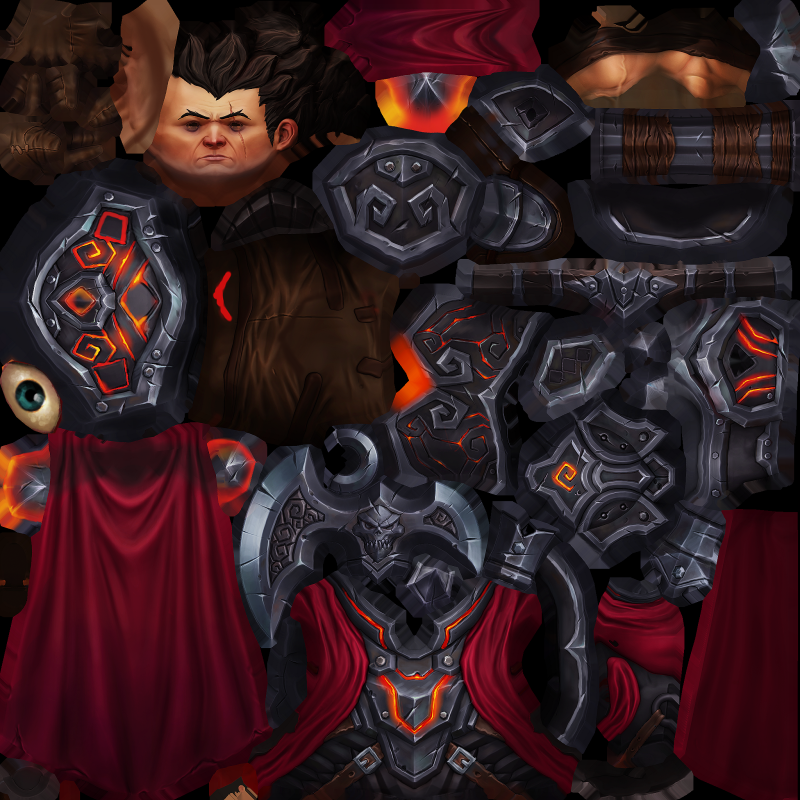 Scene Converter: Loading scene file 'darius\Darius.obj'. Scene Converter:       Child 0000: index=0001 name="Darius.obj"
Scene Converter:       Child 0000: index=0002 name="gx20default043"
Scene Converter:             Mesh 0000: index=0000 name="Mesh0"
First, the texture is provided in the TGA file format, an image format which is not supported by the Murl Engine. We therefore convert the image into the PNG file format. 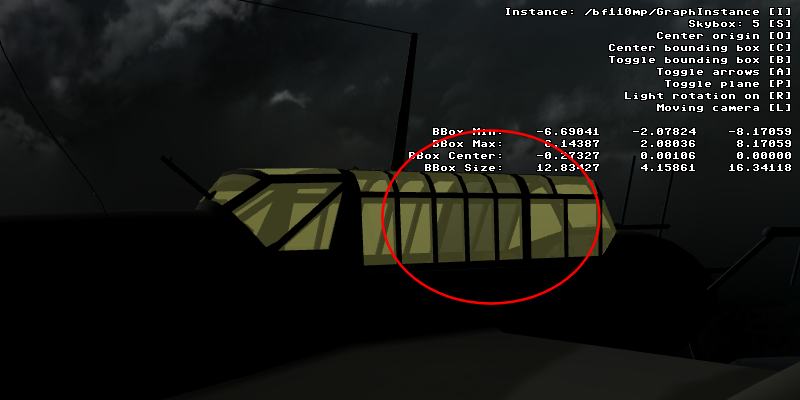 Secondly, the defined material incorrectly does not use textures. If we convert the model, it is in fact rendered without textures. 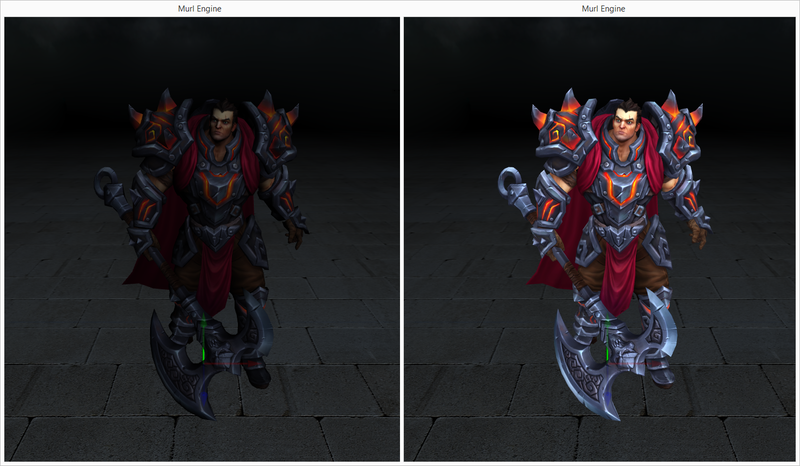 Now the 3D model is rendered with the correct texture (left picture). We can further improve the result if we specify an ambientColor to brighten up the colors. In addition we use the attributes sizeX and sizeY to reduce the texture size from 2048x2048 pixel to 1024x1024 pixel (right picture). This model is named Pony, has been created by Slava Zhuravlev and is licensed under the Creative Commons Attribution license. The author now removed the download option on Sketchfab and also changed the model slightly. Anyway, a similar model, Pony Cartoon, can still be downloaded and used for free. Thx @SaphireSouldier for the notice. The RAR archive contains the 3D model in the OBJ file format and several textures. 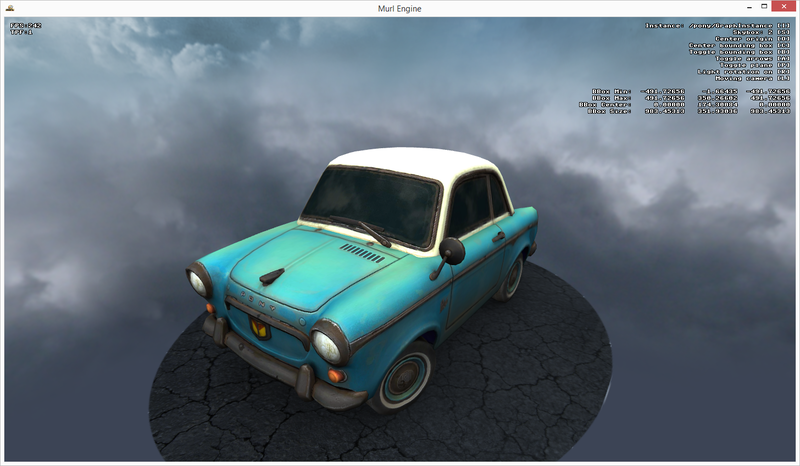 Scene Converter: Creating material texture for type 5 from file 'normalmap_dDo_n_2.png -bm 1'. Scene Converter: Creating material texture for type 5 from file 'interior_normalmap_2.PNG -bm 1'. Scene Converter: Creating material texture for type 1 from file 'Road_diffuse.psd'. A final issue still exists: The windows of the car are rendered opaque but should be transparent. The reason for this issue is that according to the Scene Converter analysis the transparency (OPACITY_VALUE) is stored in the alpha channel of the diffuse texture. Scene Converter:       Texture 0000: index=0000 name="normalmap_dDo_d.jpg" semantic="DIFFUSE_RED/DIFFUSE_GREEN/DIFFUSE_BLUE/OPACITY_VALUE"
The diffuse texture is provided as a JPG image, a file format which does not support an alpha channel. The transparency information therefore got lost. The only way to fix this issue would be to store the texture in PNG format and use a graphics editor to redraw the windows in the alpha channel. Hint! It is always preferable to model a 3D object in such a way that its transparent faces are rendered with their own material. Otherwise all opaque faces also need to be drawn with expensive alpha blending.